Set in France during the 1620s, young d’Artagnan looks to join the King’s Musketeers where he meets Athos, Porthos and Aramis. Soon the four of them become firm friends and they have adventures across the country as there’s many plots afoot. Every August Rincey from Rincey Reads on YouTube hosts a month long readalong of a large and maybe intimidating classic. This year it was The Three Musketeers, a book that’s been on my shelves for at least ten years, so this readalong gave me the push to finally read it. I’ve seen a lot of different adaptations of The Three Musketeers, I saw some of the episodes of the relatively recent BBC series and I’ve seen a whole host of the various films that have been made over the decades. So, going into The Three Musketeers, I could remember bits about the characters, their relationships, and the story but it was really interesting to learn more about them and get the whole story. I listened to the audiobook narrated by Tristam Summers and it was a great audiobook that sucked me in and I’d definitely recommend it as it made the story fly by and wasn’t as intimidating as the physical book might’ve been. The main plot of The Three Musketeers takes a while to reveal itself, instead focussing on introducing all the characters and their loyalties. I was surprised how much of the focus of the story was on d’Artagnan, especially the first third. 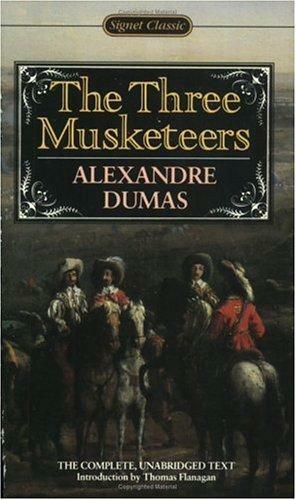 He was definitely the main character rather than the titular three musketeers themselves. Athos is the musketeer with the most backstory, I personally found Aramis kind of snarky and frequently hilarious (he’s my favourite musketeer) but he and especially Porthos were left in the background for the majority of the book. Once everyone’s been introduced the story moves along at great speed. There’s political intrigue with some people supporting the King, or more specifically the Queen, while others stand by the Cardinal who has he’s own goals. He’s a shady character who seems to have eyes and ears everywhere so when d’Artagnan and the musketeers have a mission, they have to very careful as to who they trust. The female characters aren’t treated particularly well which is a shame and is potentially a sign of the time it was written. Milady de Winter is a fantastic character though and I would read a spinoff or a prequel about her. She’s a spy and an assassin who uses men’s idea of her, that she can be nothing more than a weak, delicate woman, in order to complete her mission and in some cases get away with murder. She’s brilliant and her interactions with both d’Artagnan and Athos were always interesting. I loved The Three Musketeers. It is a proper action-adventure with some political intrigue and romance sprinkled through it as well. The characters, especially d’Artagnan, ends up in a completely different place compared to where they started, and I could never have predicted where the story goes even though I’ve seen various film adaptations. The Three Musketeers is just a lot of fun. 5/5. Thanks! Yeah I don’t think I would’ve read it if I was reading a physical copy, listening to the audio made it much easier and more enjoyable for me.